This was high on my list of must tries when I had Gingerbread girl a few months back. They look so yummy, love how you used porabello's to make it into a meal! What an innovative recipe! These mushrooms sound great! Great SRC post! Woo Hoo! These have been added to this week's dinner menu! So glad you chose this to share!! 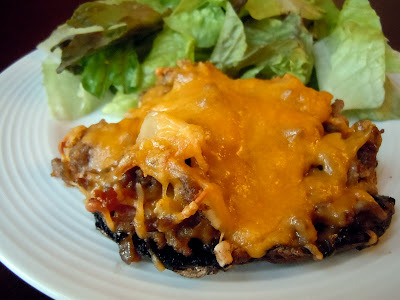 I love the fact that you used portobello mushrooms - they are my favorite kind! Every stuffed mushroom recipe you see is for an appetizer - it's good to see an entree size! O.M.GOSH-NESS these look incredible. Amy, thank you so much for the baked apple donut recipes. They are ah-mazing! I really like this idea! I will have to remember it! I see you belong to pinterest but I don't see a pin it button here - is it ok to pin your stuff on pinterest? This looks yummy!! Great recipe! A bacon mushroom cheeseburger without a bun, brilliant! I'm saving this recipe, looks like a wonderful dinner. Wandered on over here from the blog hop. This sounds incredibly decadent and delicious. 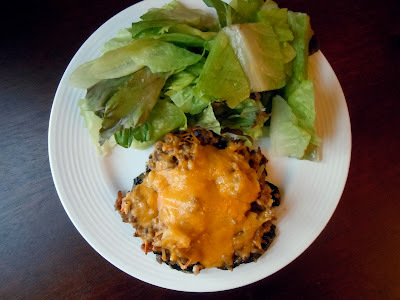 I have a friend who is doing low carb and this sounds like something she would love - all the decadent flavor of a cheeseburger without the bun. Yum!